To Cite: Kim S H, Choi J W, Park Y S, Lee J, Lee C H, et al. Added Value of Contrast-Enhanced Ultrasonography as a Planning Modality for Radiofrequency Ablation of Hepatocellular Carcinoma: Comparison with Gray-Scale Ultrasonography, Iran J Radiol. 2017 ; 14(2):e43232. doi: 10.5812/iranjradiol.43232. Background: Radiofrequency ablation (RFA) is not feasible when hepatocellular carcinoma (HCC) is poorly defined or invisible on conventional gray-scale ultrasonography (GSUS). Recent introduction of contrast-enhanced ultrasonography (CEUS) helps diagnose HCC by showing its typical enhancement pattern. Objectives: The purpose of this study is to demonstrate the added value of CEUS as a RFA planning modality for HCC compared with conventional GSUS. Patients and Methods: A total of 64 HCCs from 57 patients (men:women = 41:16; mean age, 62.6) who had undergone GSUS and CEUS for RFA planning in 2011 were retrospectively reviewed. Ultrasound contrast agent was used for CEUS after conventional GSUS. The recorded images of GSUS and CEUS were reviewed retrospectively. On GSUS, the size, location, echogenicity, and margin of each HCC were reviewed. The visibility scores of HCC on GSUS and CEUS were measured using a 3-point scale. GSUS visibility score: score 1, definite nodule with well-defined margin; score 2, slightly hypo-/hyperechoic nodule with partial margin; score 3, isoechoic nodule without margin. CEUS visibility score: score 1, arterial enhancement; score 2, only delay washout; score 3, no arterial enhancement or washout. Results: The mean size of HCCs was 1.8 cm (range, 1.0 - 4.8 cm). Among 64 HCCs, visibility score 1 were 37; score 2, 8; score 3, 19 on GSUS. By performing CEUS, 10 out of 19 HCCs with GSUS visibility score 3 showed CEUS visibility score 1. Seven out of 8 HCCs with GSUS visibility score 2 showed CEUS visibility score 1. Total 37 HCCs showed visibility score 1 on GSUS; whereas, 53 HCCs showed visibility score 1 on CEUS (57.8% vs. 82.8%). Conclusions: CEUS can be an effective RFA planning modality when a target HCC is invisible or questionable on GSUS. Contrast-enhanced ultrasound (CEUS) is an emerging imaging modality with high diagnostic performance and reliability for detection and characterization of focal liver lesions. CEUS has several advantages over other imaging modalities, such as contrast-enhanced computed tomography (CT) or magnetic resonance imaging (MRI). CEUS can illustrate real-time dynamic hepatic arterial and portal venous enhancement regardless of contrast enhancement rapidity, demonstrate consistent washout in malignant lesions such as hepatocellular carcinoma (HCC), and extra doses can be administered without a threat of nephrotoxicity, cardiotoxicity, or incidence of hypersensitivity or allergic events. Sensitivity of CEUS has shown to be comparable with that of contrast-enhanced CT and MRI. 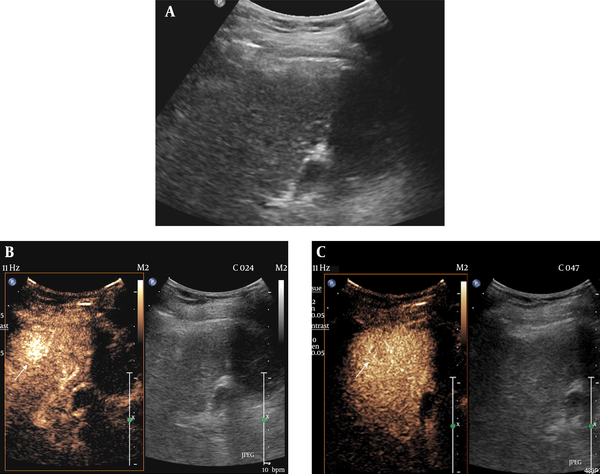 CEUS additionally provides information about dynamic enhancement pattern of liver lesion over conventional gray-scale ultrasound (GSUS), therefore overall diagnostic yield can be improved by performing real-time CEUS (1-4). HCC is one of the most common malignancies worldwide. Together with surgical resection, radiofrequency ablation (RFA) has become an important treatment modality for HCC with liver cirrhosis (5). RFA is a minimally invasive treatment modality with continuously growing popularity for the treatment of patients with primary malignant hepatic tumor with high success rates, comparable with surgical excision (5-7). Traditionally RFA is usually performed under US guidance, and demonstration of a focal hepatic lesion by US is fundamental. However, this is not always successful, since heterogeneous or coarse liver parenchymal echogenicity of the cirrhotic liver may disguise hepatic lesions on conventional GSUS. A previous study conducted by Kim et al. reported among 898 patients with known HCC smaller than 3 cm on CT or MR images, only 74.7% of HCC were visible on RFA planning GSUS (8). If a certain lesion fails to be detected on ultrasound, RFA cannot be performed in such cases, and change in the treatment plan is inevitable. Contrast enhanced CT or MRI may be useful in such cases, but these are not real-time imaging modalities, and the short time window of contrast enhancement and washout complicates accurate localization and ablation procedure. Therefore, accurate detection of the target hepatic lesion by US is fundamental to the performance of RFA. The purpose of this study was to compare the performance of CEUS with GSUS, as an RFA planning modality for HCC, thus evaluate the added value of CEUS over GSUS. This retrospective study was approved by the institutional review board, and informed consent was waivered. Seventy-one patients who have undergone GSUS and CEUS for RFA planning from January to December 2011 were reviewed. Among the 71 patients, 14 patients with non-HCC hepatic lesions such as metastasis were excluded. Finally, 64 HCCs from 57 patients (41 men and 16 women; mean age, 62.6 years old; range, 43 - 84) were enrolled in this study. All patients had liver cirrhosis and HCC was confirmed by clinical, biochemical data and typical enhancement pattern of HCC on dynamic CT or MRI. The imaging criteria for the diagnosis of HCC have been established by the European association for the study of the liver (EASL) and the American association for the study of liver diseases (AASLD) (9, 10). They emphasized the characteristic contrast enhancement pattern of HCC, including hypervascularity in the arterial phase and washout in the portal or delay phases of dynamic imaging for non-invasive diagnostic criteria of HCC. One imaging modality is sufficient for HCC larger than 1 cm in diameter, a more conservative approach with two techniques is recommended in suboptimal settings. The role of CEUS is still controversial; therefore, non-invasive diagnosis of HCC was confirmed by dynamic CT or MRI before performing CEUS in our cases. Ultrasonography was performed by three abdominal radiologists with 7 - 10 years of experience in liver ultrasound and at least four years’ experience with CEUS. Ultrasound scanner (iU22 xMATRIX, Phillips medical system, Bothell, Washington) was used during the procedure. Each patient underwent a fundamental examination of the whole liver in GSUS, and CEUS was mainly used for the evaluation of HCC lesions. Since GSUS and CEUS were performed to evaluate the feasibility of RFA ablation, radiologists were already aware of the presence of HCC in each patient by the previous contrast enhanced CT or MRI scans. Pre- and post-contrast, and real-time dynamic contrast-enhanced images were acquired on CEUS. CEUS was followed after completion of fundamental GSUS evaluation. The examinations conformed to the world federation for ultrasound in medicine and biology - European federation of societies for ultrasound in medicine and biology (WFUMB-EFSUMB) guidelines (11). A second-generation contrast agent sulfur hexafluoride (SonoVue®; Bracco Imaging SpA, Milan, Italy) consisting of phospholipid stabilized shell microbubbles filled with sulfur hexafluoride gas was used for CEUS. A bolus of 2.5 mL of sulfur hexafluoride dispersion was injected in a peripheral vein followed by a 10 mL 0.9% saline flush. After contrast bolus injection real-time scanning was performed immediately up to five minutes. If the target lesion was not delineated on CEUS, a second bolus of SonoVue was injected for a second surveillance. We recorded the arterial (< 40 seconds), portal venous and early late (40 - 120 seconds), and late delay phase (2 - 5 minutes) images. The GSUS and CEUS findings and medical records of each patient were retrospectively reviewed by a 10-year-experienced abdominal radiologist. Hepatic lesion’s size, grayscale echogenicity, visibility on CEUS, multiplicity, and presence of other hepatic nodules such as regenerative nodule (RN) and degenerative nodule (DN) were analyzed. In addition, the final treatment modality for the HCC including RFA, intra-operative RFA, transarterial chemoembolization (TACE), and surgery were reviewed. The visibility of HCC on GSUS was evaluated based on a scoring system by the echogenicity of the target HCC and delineation of its margin using a 3-point scale: score 1, the target HCC is definitely hyperechoic or hypoechoic with well-delineated margin; score 2, the target HCC is slightly hyper-/hypo-/isoechoic with partially-delineated margin, or the target HCC is surrounded by similar sized cirrhotic nodules; score 3, the target HCC is isoechoic without visible margin. The visibility of HCC on CEUS was evaluated based on a scoring system by enhancement pattern of the target HCC using a 3-point scale: score 1, the target HCC showed arterial enhancement with or without delay washout; score 2, the target HCC showed only delay washout without arterial enhancement; score 3, the target HCC showed no arterial enhancement or delay washout. The visibility of HCC on GSUS was evaluated blind to the CEUS image findings. However, the radiologists determined the visibility of HCC on CEUS knowing the GSUS image findings. The visibility of HCC on GSUS and CEUS was re-evaluated by the radiologist 1 week after the first evaluation blind to the previous visibility scores, CT and/or MR images and RFA results. In case of discordant scores between the first and second evaluations, the final score was made by the abdominal radiologist 2 who had 7 years of experience on consensus. Statistical analyses were performed by using statistical software (MedCalc, version 11.6, MedCalc Software, Mariakerke, Belgium). Cohen’s kappa statistics was used to assess the intra-observer reliability and to compare GSUS vs. CEUS visibility scores. A total of 64 HCCs from 57 patients were included in the study. The size of target HCC ranged between 1.0 and 4.8 cm (mean size 1.8 cm), and they were located throughout all segments of the liver. Among 64 HCCs, HCCs with a visibility score 1 were 35; visibility score 2, 8; visibility score 3, 21 on the first review whereas on the second review, HCCs with a visibility score 1 were 36; score 2, 9; score 3, 19. The intra-observer agreement by kappa statistic was 0.92 (95% confidence interval (CI) = 0.829 - 1.009). The final GSUS visibility score by consensus was graded as score 1 in 37 HCCs (57.8%); score 2 in 8 HCCs (12.5%); and score 3 in 19 HCCs (29.7%). Three HCCs were surrounded by multiple RNs or DNs out of visibility score 2 group. Of the total 64 HCCs, 53 HCCs showed arterial enhancement with or without delay washout [visibility score 1 (82.8%)] (Figure 1). Three HCCs showed delay washout with no arterial enhancement [visibility score 2 (4.7%)]. Eight HCCs showed no arterial enhancement or delay washout [visibility score 3 (12.5%)]. All the HCCs with CEUS visibility score 1 were GSUS visibility score 1. There was no difference of the CEUS visibility score between first and second reviews. Figure 1. 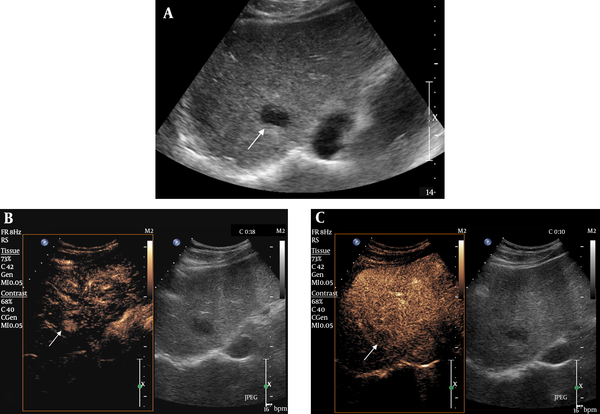 Hepatocellular carcinoma (HCC) with visibility score 1 on both gray-scale ultrasonography (GSUS) and contrast-enhanced ultrasonography (CEUS) in a 66-year-old male patient. A, A 2.3 cm hypoechoic nodule with distinct margin is clearly shown on GSUS. B, CEUS showed marked arterial enhancement of the nodule 18 seconds after contrast agent injection. C, The nodule showed washout in the delay phase two minutes after contrast agent injection. Seven out of 8 HCCs from the GSUS visibility score 2 group were classified as visibility score 1 on CEUS (Figure 2). In addition, 10 out of 19 HCCs from the GSUS visibility score 3 group showed arterial enhancement, thus increased visibility score on CEUS (Figure 3). Total 17 HCCs from GSUS visibility score 2 and 3 groups showed arterial enhancement, thus classified as visibility score 1 on CEUS (63.0%). Figure 2. 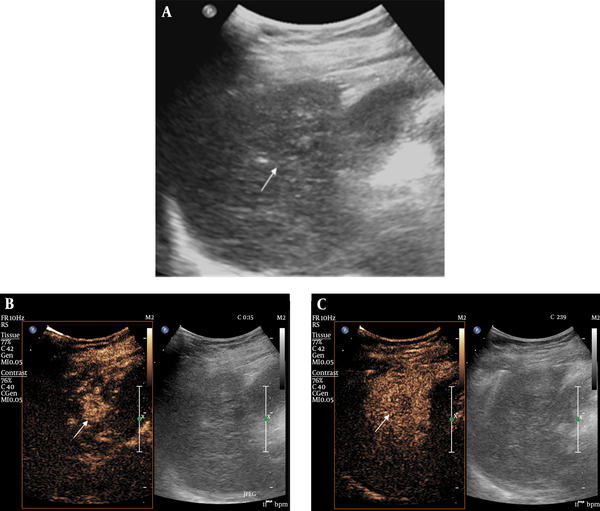 Hepatocellular carcinoma (HCC) with gray-scale ultrasonography (GSUS) visibility score 2 and contrast-enhanced ultrasonography (CEUS) visibility score 1 in a 78-year-old female patient. A, There was a slightly hypoechoic lesion with partial hypoechoic rim in S5. B, CEUS showed an arterial enhancing nodule measuring 2.4 cm, corresponding with the slightly hypoechoic lesion. C, CEUS showed washout of the corresponding lesion in the delay phase. Figure 3. Hepatocellular carcinoma (HCC) with gray-scale ultrasonography (GSUS) visibility score 3 and contrast-enhanced ultrasonography (CEUS) visibility score 1 in a 64-year-old female patient. A, The target HCC was completely isoechoic without discernible margin on GSUS. B, CEUS showed a 1.5 cm arterial enhancing nodule in the arterial phase. C, Delay washout was noted in this nodule on CEUS. Eight HCCs from the GSUS visibility score 3 were not visualized on CEUS (Table 1). Abbreviations: CEUS, contrast-enhanced ultrasonography; GSUS, gray-scale ultrasonography. When only GSUS was used as a planning modality for RFA, 37 HCCs were scored visibility score 1. However, with use of CEUS, 7 HCCs with GSUS visibility score 2 and 10 HCCs with GSUS visibility score 3 demonstrated arterial enhancement. Thus, an additional 17 HCCs were classified as CEUS visibility score 1 compared to the 37 HCCs of GSUS visibility score 1, which resulted in 46% increase for RFA candidates. A total of 37 HCCs showed visibility score 1 on GSUS, whereas 53 HCCs showed visibility score 1 on CEUS (57.8% vs. 82.8%). The agreement between GSUS and CEUS was fair (Kappa = 0.40, 95% CI = 0.145 - 0.613). For the treatment of HCCs, a total of 52 HCCs out of 64 were treated with RFA (81.3%), including 5 intra-operative RFA. Intra-operative RFA was done in cases with deep locations of the target HCCs or when a large vessel was present along the course of the RF electrode insertion. Ten HCCs were detected only on CEUS, 7 HCCs with elevated diagnostic confidence by CEUS performance from GSUS visibility score 2 to CEUS visibility score 1, and one HCC more clearly visible on GSUS were treated with RFA. However, 3 completely invisible HCCs on GSUS and CEUS were treated with RFA in reference to their specific anatomic locations, such as adjacent to a large vascular structure easily defined on US. Twelve HCCs were treated with other modalities such as operation or TACE by the patients’ or referring physicians’ decision regardless of RFA planning US results. This study showed that pre-RFA evaluation with CEUS can affect the patient’s treatment plan since RFA treatment can become a treatment option for the previously undetected HCCs on GSUS. Still, surgical resection is a treatment of choice in the treatment of HCC, but the majority of HCCs are not suitable for curative resection at the time of diagnosis. Moreover, surgical resection is difficult in cases with advanced cirrhosis, tumor multicentricity, vascular, and extrahepatic involvement (12, 13). In such cases, RFA under ultrasound-guidance is widely performed for small HCCs less than 3 cm up to three lesions or single medium-sized HCCs (14). RFA is a widely performed treatment modality due to the ease of use, safety, reasonable cost, and applicability to minimally invasive techniques (15). Previous studies reported that percutaneous RFA achieved the same overall and disease-free survival rates as surgical resection for patients with small solitary HCCs (16, 17). However, RFA requires the obvious demonstration of a focal hepatic lesion on ultrasound. For assessment of lesions that remain unclear on GSUS, CEUS is an excellent additional diagnostic tool. CEUS allows reliable and accurate tumor detection in the liver that cannot be recognized in conventional GSUS (1-4). The information gathered during the wash-in phase and various perfusion phases including arterial, portal venous and late phases allowed the characterization of different liver tumors. Ultrasound contrast media is a blood pool tracer and has been used due to its ability to overcome the limitations of conventional GSUS or power Doppler US by demonstrating parenchymal microvasculature (18). The first-generation ultrasound contrast agent (galactose 99%, palmitic acid 1%, Levovist®; Schering, Berlin, Germany) was first introduced in 1996, as air with a galactose and palmitic acid surfactant, and its main indications included heart, abdomen including vesico-ureteric reflux, and transcranial US. Sulfur hexafluoride microbubbles were introduced in 2001. It consists of sulfur hexafluoride with a phospholipid shell, and its main indications are cardiac, macrovascular, liver and breast lesions. Sulfur hexafluoride has enhanced stability and resonance behavior at low acoustic pressure compared with first generation contrast agents. Another second generation contrast agent perfluorobutane (Sonazoid®; GE Healthcare, Tokyo, Japan), is a lipid-stabilized suspension of perfluorobutane gas microbubbles that facilitates obtaining a real-time blood flow image in addition to a stable Kupffer phase, lasting up to 120 minutes after injection (19, 20). A number of studies evaluated the role of CEUS as a guiding tool in minimally invasive ablation therapies using ultrasound contrast agents. There were previous studies reporting the added value of CEUS in detection of focal hepatic lesions, adding strength to use of CEUS as a planning modality for RFA. Maruyama et al. reported CEUS with Levovist facilitated the application of percutaneous US-guided treatments, such as RFA and percutaneous ethanol injection (PEI), by successful localization in 75% of ultrasonically invisible hypervascular HCCs (21). Numata et al. reported that contrast-enhanced harmonic ultrasound diagnosed 97% of viable HCCs, and 14/15 (93%) lesions not detected by conventional GSUS were successfully treated by percutaneous ablation therapy guided by CEUS (22). A recent study by Chan et al. also showed CEUS provided fair visualization of HCCs that were either poorly visualized or not visualized on GSUS (23). These studies strongly enhanced the need of CEUS in order to perform percutaneous US-guided treatments such as RFA or PEI. The results of our study are in agreement with most of the previous reports on guiding effectiveness of CEUS before RFA. In our study, more than half of ultrasonically unrecognized hepatic lesions were successfully demonstrated by CEUS with sulfur hexafluoride microbubbles, therefore, added as a candidate for RFA treatment. The visualization rate of target HCC in our study is not as high as that of the previous studies, this may be due to the difference between first and second generation contrast agents, tumor size, and presence of multiple RN or DN in the cirrhotic liver background. When the operator’s confidence about a target lesion is low on GSUS, it is practically impossible to perform US-guided RFA, especially when there are multiple similar nodules such as DN or RN adjacent to the target HCC. Therefore, when the location of the HCC is equivocal on GSUS, the operator will hesitate to perform RFA, analyzing the benefits and risks of a blind ablation. In our study, there were eight lesions with GSUS visibility score 2, which were incompatible to perform RFA after conventional GSUS. However, by performing CEUS, 7 HCCs showed marked arterial enhancement, confirming the location. Therefore, HCCs were successfully treated with RFA. CEUS cannot only depict previously invisible HCCs on GSUS but also elevates diagnostic confidence of previously equivocal hepatic nodules. RFA can be performed under ultrasound, computed tomography, or fluoroscopy guidance. There have been studies when HCC is invisible on conventional ultrasound, CT-arteriography or iodized oil injection, or post-TACE fluoroscopy images can be helpful in the detection and guidance of minimally invasive procedures. Real-time CT fluoroscopy can be used for needle puncture guiding, and the efficacy of treatment can be evaluated directed by CT scan after the procedure is performed (24). However, ultrasound is the most frequently used guiding modality for RFA due to its accessibility, lack of radiation, feasibility, and real-time guidance. Moreover, ultrasound offers good spatial resolution for treatment monitoring. Recent technical expansion of real-time virtual sonography (RVS), a diagnostic imaging support system that can be synchronized with B-mode ultrasound images reconstructed from high-quality multiplanar reconstructed (MPR) CT and MR images can be used in the detection of HCC nodules that are not visualized by GSUS. Nakai et al. reported that RFA was technically feasible and local tumor control was achieved in all patients (25). RVS displays equivalent cross-sectional MPR images as ultrasound images on the same monitor screen in real time, using volume data from CT or MRI, assisting in hepatic lesion detection. Many reports emphasized the effectiveness of RVS, RVS-guided RFA treatment and its efficacy for HCC is promising (26, 27). However, technical difficulties remain. Real-time virtual sonography and CT may not always correlate accurately, since respiratory movements, changes in posture, and bowel peristalsis may cause distortion in images (28). In these settings, CEUS may be helpful. Toshikuni et al. reported 55 out of 60 (90%) inconspicuous HCC nodules were identified with RVS. Moreover, by using US contrast agent, the detection rate has increased up to 96.7% (29). There were several limitations in our study. First, most HCCs were not pathologically confirmed. Diagnosis was made by CT or MR imaging according to non-invasive diagnostic criteria approved by EASL and AASLD of typical arterial enhancement and delay washout pattern of HCC. Furthermore, all of our cases had liver cirrhosis that supported imaging diagnosis of HCC without pathologic verification. Only one case was pathologically confirmed by percutaneous core needle biopsy due to its small size. Second, selection bias may have been present, since HCCs with a high probability of RFA treatment were requested for CEUS by a referring physician in the first place. HCC that was not suitable for RFA due to its deep, subcapsular, or perivascular location may have been excluded in the first place even without performing CEUS. Third, only a small number of cases were included in the study compared to the larger studies performed previously. Finally, eight out of 19 HCCs with GSUS visibility score 1 were not delineated on CEUS. Therefore, they could not be an RFA candidate. The possible explanation for those undelineated HCCs is due to their completely isoechoic nature, the target lesion was not precisely located on the first scan of GSUS so following CEUS could not demonstrate the lesion. In addition, short time window of arterial and delay phases of contrast agent of CEUS further limited the detection of the target tumor. In conclusion, CEUS can demonstrate a poorly-visible or invisible HCC on GSUS by showing arterial enhancement or delay washout, thus increased number of possible candidates for RFA treatment. CEUS can be an effective planning modality for RFA especially when a target HCC is invisible or questionable on conventional GSUS. The authors would like to thank Yun Mi Seo, research assistant, for her help in preparing this manuscript.